Hi everyone. Welcome to The Ultimate Korean Pronunciation Guide. In this series, you'll master Korean pronunciation. Proper pronunciation is essential in Korean, and in this series, you'll learn it in a fast, comprehensive, and easy way. In this first lesson, you'll learn two key points for mastering Korean pronunciation. The first key point is to master the pronunciation of 24 basic Korean letters. The Korean alphabet has 14 basic consonants and 10 basic vowels. One letter represents each of these sounds. These are then written out in blocks to form each syllable. This block has two letters, one on top and one at the bottom. The letter on top is the consonant 'N'. Below it is the vowel 'u'. Combined, you read the block "Nu." Listen to the native Korean speaker. You can add another letter to the bottom of this block. Compare the top and bottom letters. Can you read the block? The bottom letter is the N sound — just like the top letter. Combining these with the vowel in the middle, you pronounce the whole block "nun," which means "eye" in Korean. You will see many different block arrangements in Korean. But once you master the pronunciation of the 24 basic letters, you can read any of these blocks in Korean. Each syllable in Korean is pronounced for the same length of time with equal stress. For example, when you say 'Camera' in English, you put stress on 'ca-' and say it for longer than the other syllables of the word. But in Korean, each syllable is pronounced for the same amount of time and gets equal stress. Listen to the word, 'Camera' in Korean. This principle applies throughout the entire sentence, not just for individual words. Listen to the Korean sentence. Now to close this lesson, here's a question for you. Why should YOU, including advanced speakers, spend time on learning proper pronunciation? You will be understood, and this will help you build more confidence as you communicate in Korean. 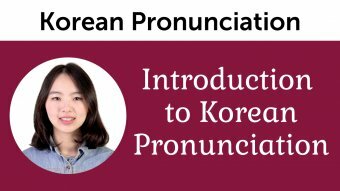 For beginners, you're on the path to learning proper pronunciation, and for more advanced students, this is a chance to finally master Korean pronunciation. Now you know the basics of Korean pronunciation. In the next lesson, you'll learn the top five mistakes people make. You'll want to avoid these at all costs, so please stay tuned. What is the hardest part of Korean pronunciation? See you in the next Ultimate Korean Pronunciation Guide lesson. Is the Korean pronunciation similar to your language's pronunciation? Keep up practicing and soon you'll get great results! Thank you for posting, we're very happy to hear that this lesson was of help to you! Please don't hesitate to let us know if you have any other inquiries. Thank you for posting--we're sorry to hear that you are having difficulties pronouncing ㄹ. 실례합니다 is pronounced with the tongue touching the back of the teeth (as you pronounce 례)...try pronouncing it slowly until you get the hang of it. The hardest part for me is figuring out how to pronounce ㄹ in different words. It was said that the tongue is supposed to touch the ridge of the roof of the mouth behind the teeth but it's hard to do that in 실례합니다. *Shrugs*. Is [아파트] the word you meant? I'm sure this series and "Hana Hana Hangul" series will be very helpful for learning how to form Korean Syllables. Here is the link to the series titled "Hana Hana Hangul". Hope you find our lessons helpful, and please let us know if you have any other questions! Your name in Hangul would be [조슈아(jo-shu-ah)]. Hope you like your Hangul name. See you around!